ROLSI is proud to host occasional Special Issues devoted to topics of particular interest or significance. 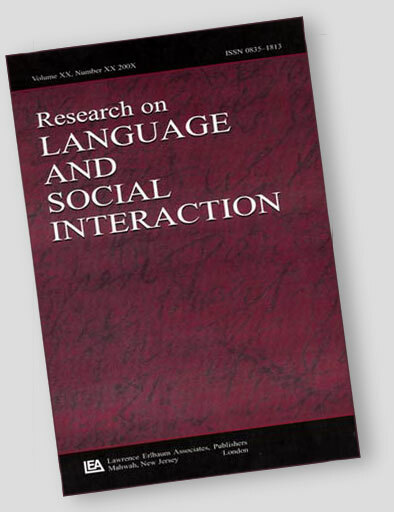 In this guest blog, Anna Spagnolli, Ilkka Arminen and Christian Licoppe tell the story of their editorship of an SI on the very lively topic of mediated interaction – communication via phone, text, videoconference and a host of other modern technological media. In George Eliot’s words, humans can do nothing without the make-believe of a beginning. We’ll set the beginning of the ROLSI special issue on “Orders of mediated interaction” a few years ago, when we started organizing a stream of panels at the International Conference on Conversation Analysis (ICCA) in 2010. By the time the stream was repeated at the subsequent edition of ICCA in 2014, we converged more firmly on an EM/CA approach to mediated interaction deriving from our work in mediated communication, mediated presence and multimodality. We then decided to coordinate – not to say ‘mediate’ – the creation of a showcase of EM/CA studies on mediated interaction guided by the methodological aspects we considered important to highlight, and to make such showcase more permanent and accessible than in a conference panel. This is how the idea of ROLSI special issue took shape. The journal, the authors and the reviewers made collaboration dreamily fruitful, and the project took off in a set of iterative cycles, leading to the published version that includes four contributions: “Orienting to Emotion in Computer-Mediated Cognitive Behavioral Therapy” (by Stuart Ekberg, Alison R. G. Shaw, David S. Kessler, Alice Malpass and Rebecca K. Barnes), “Practices of Organizing Built Space in Videoconference-Mediated Interactions” (by Johan Hjulstad), “Embedded Reference: Translocating Gestures in Video-Mediated Interaction” by Paul Luff, Christian Heath, Naomi Yamashita, Hideaki Kuzuoka and Marina Jirotka) and “Providing Epistemic Support for Assessments Through Mobile-Supported Sharing Activities” (by Joshua Raclaw, Jessica S. Robles and Stephen M. DiDomenico). Across these four papers, which also have a history and an import independent of the special issue project, some common principles are weaving and working in the background. We highlight these principles in our introductory paper “Respecifying Mediated Interaction” and we are now trying to summarize them here, as the inspirational motives of this special issue. As the early CA work on landline telephone calls shows, the study of social interactions mediated by communication technology is not a novelty introduced by networked computers and mobile phones. Those early analyses of telephone calls, however, were not interested in the role played by the medium in creating the structure and meaning of the social interactions observed, since they pursued more preliminary, foundational goals in the study of interactional practices. Then at some point, given the high availability of communication and information technology to carry out interactions, the interest in mediated interactions qua mediated started breaking out. Now that many CA studies on mediated practices are being published or presented at conferences, we can try and tie together scattered reflections, concepts and remarks to describe the nature of interaction in technology-mediated settings from an EM/CA perspective. This special issue on ‘Orders of mediated interaction’ pursues this goal. Its four papers pay special attention to explaining the role of the medium as a resource to interaction; in parallel, our introductory paper tries to clarify more generally the role of mediated interaction in the fabric of normality. For a refined notion of mediation, we had to look outside the conversation analysis domain and at the pragmatic, critical approach to human action and cognition brought about by psychologists, computer scientists and social scientists such as Donald Norman, Lucy Suchman, Terry Winograd and Fernando Flores, Richard Dreyfuss, David Kirsh and many others. As conversation analysts opposed objectivized notions of language and meaning, so those authors opposed a simplified rendition of mediated interaction. But then one has to try and condense that conceptual tradition into an EM/CA analytic approach: after being imbued with that conceptual legacy, how would one proceed and analyze the details of mediated interaction? Our response is: by grounding any difference (and similarity) with face-to-face interaction in the data, instead of presuming it; and by grounding in the data any account of a given interactional phenomenon in terms of the communication medium that the interactants are using. In this way, the claim that technology mediates an action will be the result of the analysis instead of its starting point. We summarized this methodological approach in the principle of procedural consequentiality. While information and communication technology as a subject of inquiry can look dull to some scholars and raise no particular fascination to motivate their scientific effort, by no means can it be considered as a neutral subject. On the contrary, technological change and innovations have engendered very strong reactions throughout history, either in favor or in contrast. Moreover, across technologies and historical periods, the arguments supporting pro and con positions surprisingly recur, with the result that discourse get easily and recurrently stuck around the same prejudicial positions both in society and in science: naturality versus artificiality, empowerment versus alienation, risks versus possibilities. Currently digital and mobile information and communication technology makes no exception. Due to its relying on immaterial, remote, synthetic objects and tools, it is easily considered as creating a domain apart, different in quality from typical or normal interaction, and deficient if compared with face-to-face interaction. One advantage of the psychological and sociological approach to mediated interaction referred to above is that it undermines the scientific bases of such prejudicial representations of technology. As we show in the central sections of our introductory paper, EM/CA has accumulated evidence to show that mediated interaction is not essentially deficient or disruptive. As Ayaß (2015) observes, transcripts inhabit a space between art and figure; yet there are some limits to artistic invention in transcripts and these are represented by the kind of information that is useful to report and by the standards that make symbols rapidly intelligible. Probably those aspects combined contribute to defining some CA aesthetics in transcriptions that offers a different viewpoint on the contribution made by each paper. When transcribing mediated interaction, one can get lost in the amount of details and events to possibly include in the transcription or be dismayed by the difficulty in transcribing effectively a piece of interaction that spreads across different physical and digital environments. The articles in the special issue met this challenge bravely and the transcripts in the special issue make an interesting gallery. They offer various elegant solutions – that we discuss in our introductory paper – to display interaction occurring over fragmented, asymmetric, multi-modal, multi-source settings, without creating anything so unusual to demand the reader to get accustomed to a totally new set of symbols and conventions. We cannot but thank again all the colleagues who contributed to this project as authors and reviewers, and ROLSI.